Bruntse was first climbed in 30 May 1954 by Colin Todd, Geoff Harrow of the Hilary New Zealand Expedition. They have climbed the mountain by the South -East Ridge. Since than many climbers have used this route and got succeeded. This mountain has also been becoming coveted day by day like the other Pumori, Ama Dablam as well as Everest too. The expedition dispatches can be read directly from the Baruntse 2011 expedition page they have specially set up. If it does not work yet, it will in a day or two. This itinerary is for my own 2011 expedition, but similar timetable will work for other years too or for the spring season. I have put up a Google Earth file[urldisplaymode=nomap] which shows the whole route in both day by day tracks and as a whole route. Here is a map of the region taken from Everest region trekking guide by Partha S. Banerjee. 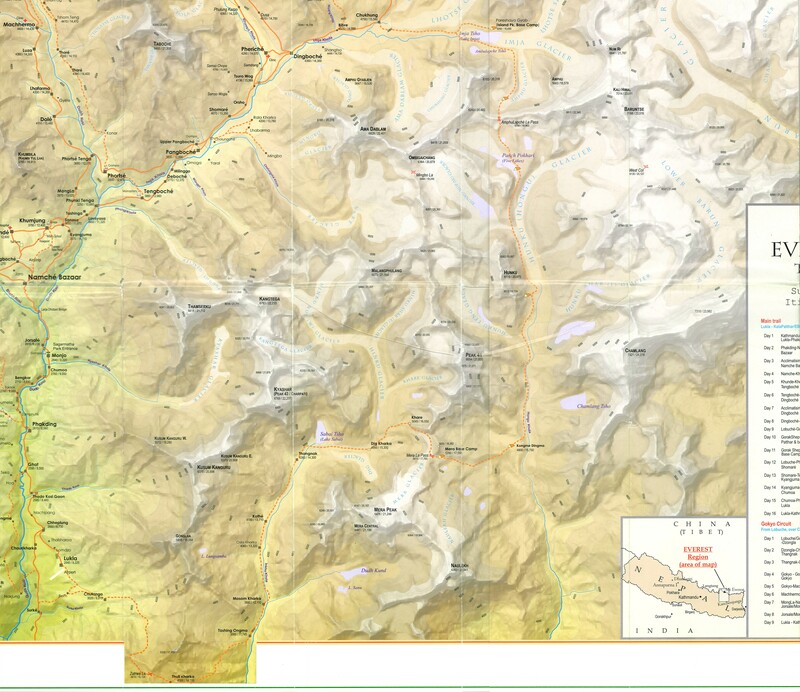 Map of the Barun-Makalu National park area. The map shows the region of park where the Mera Peak and Baruntse route goes. The route goes around an circle starting from Lukla to the East towards Mera Peak and then anti-clockwise via Baruntse and Amphu Laptsa pass to the main Everest trail and back to Lukla. Map taken from Everest trekking guide by Partha S. Banerjee. Congrats, you made it to the top! Pictures pictures pictures pls… !